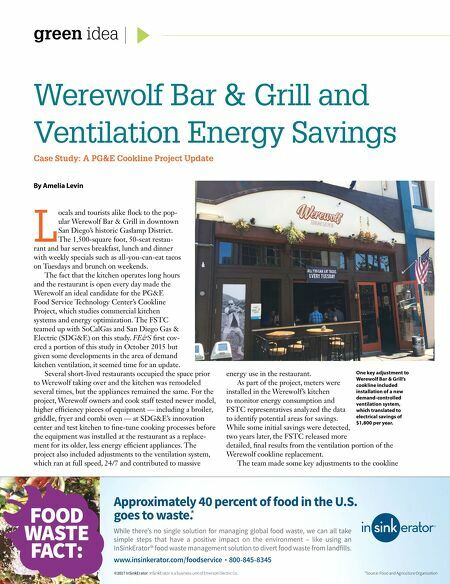 green idea Werewolf Bar & Grill and Ventilation Energy Savings Case Study: A PG&E Cookline Project Update By Amelia Levin L ocals and tourists alike flock to the pop- ular Werewolf Bar & Grill in downtown San Diego's historic Gaslamp District. The 1,500-square foot, 50-seat restau- rant and bar serves breakfast, lunch and dinner with weekly specials such as all-you-can-eat tacos on Tuesdays and brunch on weekends. The fact that the kitchen operates long hours and the restaurant is open every day made the Werewolf an ideal candidate for the PG&E Food Service Technology Center's Cookline Project, which studies commercial kitchen systems and energy optimization. The FSTC teamed up with SoCalGas and San Diego Gas & Electric (SDG&E) on this study. FE&S first cov- ered a portion of this study in October 2015 but given some developments in the area of demand kitchen ventilation, it seemed time for an update. Several short-lived restaurants occupied the space prior to Werewolf taking over and the kitchen was remodeled several times, but the appliances remained the same. For the project, Werewolf owners and cook staff tested newer model, higher efficiency pieces of equipment — including a broiler, griddle, fryer and combi oven — at SDG&E's innovation center and test kitchen to fine-tune cooking processes before the equipment was installed at the restaurant as a replace- ment for its older, less energy efficient appliances. The project also included adjustments to the ventilation system, which ran at full speed, 24/7 and contributed to massive energy use in the restaurant. As part of the project, meters were installed in the Werewolf's kitchen to monitor energy consumption and FSTC representatives analyzed the data to identify potential areas for savings. While some initial savings were detected, two years later, the FSTC released more detailed, final results from the ventilation portion of the Werewolf cookline replacement. The team made some key adjustments to the cookline ©2017 InSinkErator InSinkErator is a business unit of Emerson Electric Co. *Source: Food and Agriculture Organization While there's no single solution for managing global food waste, we can all take simple steps that have a positive impact on the environment – like using an InSinkErator® food waste management solution to divert food waste from landfills. www.insinkerator.com/foodservice • 800-845-8345 Approximately 40 percent of food in the U.S. goes to waste. 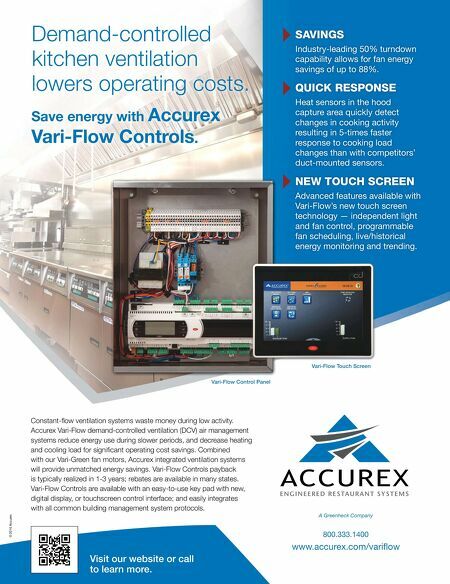 * FOOD WASTE FACT: One key adjustment to Werewolf Bar & Grill's cookline included installation of a new demand-controlled ventilation system, which translated to electrical savings of $1,800 per year.